We read that we are in the world and there we must remain. The Christian has been strategically placed in the world as a place of testing, a proving ground, and a place of service. This means that his thoughts, his life, and his heart cannot be controlled by the world and are derived from another source by another Master. This communication channel must remain unbroken in spite of the world in which he is resident. The Christian must become acutely aware that he is not opposed by the material forces of the world but rather by its unseen spiritual reality. Because he is in communion and communication with Jesus Christ he fights not against flesh and blood but against “the principalities, against the powers, against the world-rulers of this darkness.” Just as Jesus had assurance from the Father he too is assured that he does not belong to this world and that he is freed from the violence and the fatality of the world which is moving ever closer towards death. Through the gift of liberation and freedom he can fight against the spiritual realities of the world, in the midst of the world, while remaining separated from its malignancies. At this point my method of approach and thought need to be clarified. There is a form of reasoning in the matrix called the dialectic method. Simply stated dialectics is essentially a discourse between two or more people holding different points of view about a subject but wishing to establish a truth through reasoned arguments and can be formulated like this, thesis + antithesis = synthesis. This method has one flaw when applied to Christian thesis and its antithesis in the world, there can be no synthesis. For the Christian the formula looks more like this, truth + lie = compromise = lie. Hegelian dialectics is used successfully in the world (and has been used even in the Church recently as a management technique for conflict resolution to grow large congregations) because truth in the world is subjective and compromise is the norm. In Christian thought the dialectic method is used to emphasize truth when interjected into a conversation to highlight the crisis and propose its historical resolution, the cross. Theologians appear to have a general fault, they always seek synthesis or unity through compromise at the expense of truth; in the nature of truth there can be no compromise. In the fallen world all thought, action, and existence can be boiled down to what is called “necessity.” Necessity is the enslavement of man to sin. Before the Fall of man into sin creation was characterized by a total absence of necessity, man was free to be man as God had intended. Necessity had its origin in the Fall, in a shift from the order of freedom in Eden to the order of necessity in the world, as man lost his free spontaneous communion with God he was no longer able not to sin. Man is no longer free and embraces only an illusion of freedom through the machinery of state, propaganda and a form of truth called religion. Therefore the dialectical goal of synthesis, i.e. unity, can never be achieved because true Christian freedom cannot be attained inside the matrix and outside of Christ; in the parallel world of the Matrix freedom and truth cannot be nailed down and are constantly being redefined according to necessity. The natural man of the world – and unfortunately many who claim to be Christian – are incapable of seeing below the surface into the spiritual reality in which they are struggling (I Cor. 2;14). He only sees those things that float to the surface, issues of social, political and economic problems, and he attempts to work and find solutions with the methods of the established order. As a result, the world of modern man and government are not able to save itself from its suicidal slide into death, the more so-called “progress” he makes, the more he is aware of the inadequacy of any human solution. The only chance of survival is to speak into the situation from a position outside the matrix as an ambassador of truth. In a world of illusions only that person who is in a fixed and stable position shielded from the spirits of darkness can deliver the urgent message to flee the wrath to come. The Christian, then, who is “in Christ,” must not define the problems of society in the same terms as those who have no faith. Understanding spiritual realities with the “mind of Christ” (I Cor. 2:16), they must recognize that world situations can only be addressed by the gospel of Life in Jesus Christ. As “watchmen on the wall” of the world, Christians can “stand in the gap” by placing themselves at the point where the suicidal death-wish of society is most prevalent, manifesting the presence of life in the midst of death, the joy of freedom in the city of necessity, and that by the grace of God. The greatest deception of the matrix is by a technique called propaganda. Propaganda is the calculated projection of the social situation in a way that individuals believe they are making informed personal choices while they are adapting and conforming to an orchestrated strategy of management. Propaganda is the influencing of behavior in a definable and predictable way in order to provoke specific acceptable responses and actions which bring about mass participation of individuals in the collective organizational matrix. It is the Christians job to shine the penetrating light of truth into this network of lies, half-truths, and innuendos. 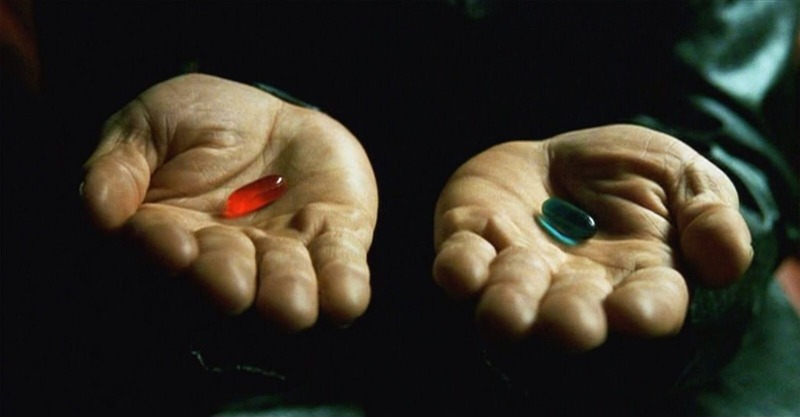 The whole idea of the matrix is to reassure the people that they are moving within the safe slow moving stream of society and history, and to convince them that they are on the verge of entering a new, better society and that technology will open the door to a healthier world. A primary agent for the propagandizing and practice in modern society is mass media and involvement of people in entertainment and politics, especially in democratic societies where people are led to believe that it is “governance by the people for the people.” Politics gives the individual within society the illusion of freedom by creating a sense of effective participation. The “political illusion” of popular participation, general control by the people, and collective problem-solving of social problems, falsely fulfills the need that individuals have for meaning, importance, effectiveness and security, leading them to surrender themselves all the more to the politicized state and the technological system. When all values of Church and state are integrated, historically, those values have become a cocktail of demise. Behind the curtain of visible, physical, and social spectacles are evil spiritual powers pulling levers that endow certain things and actions with “sacred” meaning. The sacred is defined as that in which individuals find their “faith, hope and love,” that which calms their fears, feeds their devotion, and is alleged to provide meaning, value, happiness and abundance. The primitive Church initially removed all the sacred symbols of idols and nature but slowly allowed others to replace those symbols such as the elevated status and position of the institutional Church and the Bible. The Reformation went far in de-sacralizing the Church but with the invention of the printing press erected a new idol, the sacred Book. In the United States we see all the above values displayed in our own idols plus a few more including the flag and the Statue of Liberty and the way in which Christians have incorporated these symbols into their worship. If necessity is the result of the Fall then freedom is its polar opposite, but this freedom is not the popular freedom of American patriotic Christians which is the freedom of the matrix, but rather the freedom inherent in being a citizen of Heaven. God is a God of liberation from every tie that binds a person to the matrix. The victory of Christ on the cross, and every Christian who is “in Christ,” has severed the bonds to this world and all of its machinery. Therefore, no constitution, no law, no dictate or bill of rights has any authority over Christ or the child of God. Christ in His perfect freedom chose to keep the law. Free, He chose to live out the will of God. Free, He chose incarnation. Free, He chose to die, and in like manner we freely chose to follow Him. Christ is the correct and only source of perfect freedom which does not retreat from the world in fear. Freedom is the Christian’s free expression of Christ within the socio-political realities of this matrix/world. Christian freedom can be characterized as a windmill which is energized by the tension or pressure created by the movement of the wind, and uses this tension to produce effects. The only thing that is dreaded is calm inactivity, for then nothing is accomplished. There is no expectation that his actions will change the world. All of the contradictions and tensions will remain as they were. The Christian only introduces a counter-point into the matrix to inhibit its progress long enough to perform his mission. The Christian’s only expectation is to please his Commander and to live free, within the borders of an enemy nation, governed by love. Nevertheless, Christian freedom is not arbitrary or undefined. While freedom in Christ is totally open-ended, it is not without specific orientation or direction; he is not left without a compass. It will always consist of love for one’s neighbor and be directed towards the glory of God. Thanks for your response, Steve – it’s always encouraging to know that there are others who “see the kingdom”. I only wish that some of your former contributors were still around to join in the conversation. I have to admit that I am not very good at promoting my blog, I have just let it go whichever direction it wanted to go. I know there are those who read the articles but for their own reasons choose not to comment. On occasions, I will get a private email with a comment so I answer them privately because they probably do not want others to know that they are secretly in agreement with such a “foreign” doctrine. The things I say are not popular either Christianly or nationally so I generally get discounted without a hearing but that is okay, it is to be expected. Standing in the gap has always been a dangerous and lonely place to be but I have good company. If you ever want to put your own thoughts on IndyWatchman you are welcome to do so even if they do not agree with me.